One of the biggest things that makes Arabic seem so daunting is its alphabet. It basically just looks like a bunch of squiggles and dots before you learn it, as you can see in this screen cap from the South Park episode Imaginationland. Learning the alphabet is an essential first step when learning Arabic. Without knowing it you can't start to learn anything else about the language. One of the most difficult aspects of the Arabic alphabet is the fact that simply adding a dot to a letter, in many cases, makes it a totally different letter. You have ب ,ي ,ن ,ت ,ث which are all the same except for the number of dots they have and whether those dots are above or below. Many people confuse these similar letters for a long time when learning Arabic. You really need a way to distinguish the Arabic letters from each other and remember what sounds they make. That is why the Arabic Genie program is so nice. It offers memory aids for each letter and dozens of exercises that cement the sound and shape of each letter in your mind. 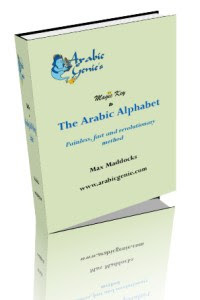 It teaches you how to spell English words with the Arabic letters, a method which connects the new Arabic letters to something that you are familiar with and have been using all your life.Once you go through the program and learn the sounds and shapes of each letter, the book introduces you to Arabic calligraphy. I find certain Arabic calligraphy very difficult to read. 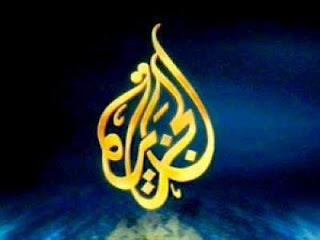 I remember when I was first learning Arabic I asked my teacher what the logo on the Al Jazeera channel said. My teacher laughed at me and told me that it said "Al Jazeera". It took me months to figure out where each of the letters were in the logo, which dots went with which letter, and which markings were just for decoration. I had to figure it out on my own, but Arabic Genie points out where each letter is in several calligraphies, a tactic which you will be able to apply to all Arabic calligraphy you come into contact with in the future. Arabic Genie turned out to be a much better program than I expected. It takes things that make total sense to Arabs, but not so much sense to English speakers, and explains them in a way that is perfectly logical and simple. If I ever hit my head and forget Arabic I know where to turn to start relearning it. 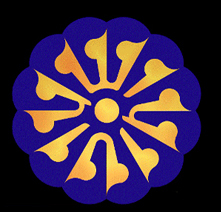 To buy a copy of the Arabic Genie, click here. can you work out what it says?